'Nightflyers' Cast Debuts Trailer for George R.R. Martin's New Show at Comic-Con! 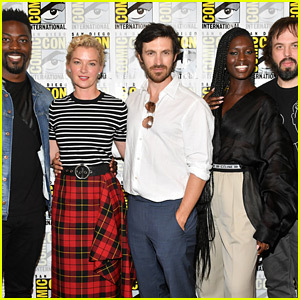 The cast of the new series Nightflyers gathers for a photo while attending day one of 2018 Comic-Con on Thursday (July 19) in San Diego, Calif.
David Ajala, Gretchen Mol, Eoin Macken, Jodie Turner-Smith, and Angus Sampson were on hand to debut the first trailer for the upcoming Syfy series, based on the book by “Game of Thrones” author George R.R. Martin. Martin was scheduled to attend the show’s panel, but was too busy writing and was unable to make it. He sent a video message instead. Nightflyers, premiering this fall on Syfy, takes place hundreds of years in the future when humans have colonized the solar system. Earth, Mars, and the Belt are now on the brink of war and all it will take is a single spark.